Kannur is the key contributor to the cultural, religious, political and industrial heritage of Kerala. The district enjoys the credit of having been the cradle of many colourful folk arts and folk music of Kerala. Most of the handloom textile items being exported from India are manufactured at Kannur. Timber is another commodity of business in Kannur. Beedi, the poor man’s cigar, is a cottage industry that employs hundreds of thousands. Most of the families in Kannur survive either by manufacturing beedi or producing handloom. Kutta Naithu, weaving baskets and carry bags out of reeds is another tiny industry of Kannur. With the Western Ghats in the East, Kozhikode and Wayanad districts in the South, Arabian Sea in the West and Kasaragod district in the North, Kannur district is bounded by a wealth of natural beauty. Muzhappilangad Beach, the only drive-in beach in Kerala is in Kannur district. Payyambalam Beach: (2 km from Kannur) This long and clean beach of Kannur town is famous for its flat laterite cliffs that just into the sea. The well laid gardens and the massive landscaped sculpture of Mother and Child make it extremely captivating. Valapattanam: (7 km from Kannur) The small town on the Valapattanam river is well known for its wood based industries and timber trade. The port of Azhikkal and Azhikkal Beach are located nearby. Parassinikadavu Muthappan Temple: (18 km from Kannur town) Sree Muthappan Temple stands on the banks of the Valapattanam River. This pilgrim centre is famous for the Muthappan Theyyam performed every morning and evening. Parassinikadavu Snake Park: The Snake Park in Parassinikadavu is the only one of its kind in Kerala. Snake demonstrations conducted every hour draw large crowds of visitors. Arakkal Kettu: (3 km from Kannur) This was the residence of the former Arakkal Ali Rajas, the only Muslim royal family of Kerala. St. Angelo Fort: (3 km from Kannur) This seafront laterite fort was constructed in 1505 AD by the first Portuguese Viceroy, Don Francisco De Almeda, with the consent of the ruling Kolathiri Raja. After changing hands from the Portuguese to Dutch and then to the English, the fort became one of the important military centres of the British in Malabar. Dharmadam Island: The small 5.5 acre island covered with coconut palms and dense bushes is a beautiful sight from the beach. Kizhunna Ezhara Beach: (11 km from Kannur) This beautiful stretch of sand is one of the most secluded beaches in Kerala. Madayipara: (25 km from Kannur) The Madayikavu Temple, the Vadukunnu Temple and the 12th century mosque built by Malik bin Deenar with white marble imported from Arabia, are the major attractions here. There is also a dilapidated fort at Madayi which is supposed to have been built by Tipu Sultan of Mysore. Muzhappilangad Beach: (15 km from Kannur and 8 km from Thalasseri) Black rocks protect this long, clean beach from the currents of the deep, making its shallow waters a swimmer’s paradise. Perhaps this is Kerala’s only drive-in beach where you can drive down the entire length of 4 km. Raja Rajeswara Temple: (21 km from Kannur) Situated near Taliparambu town on the National Highway this temple is dedicated to Lord Raja Rajeswara. Lord Siva is worshipped as the Presiding Power. Gundert Bungalow: (20 km from Kannur near Thalasseri town on the NH at Illikkunnu) Dr. Herman Gundert, the revered German missionary, scholar and lexicographer lived in this bungalow for 20 years from 1839. It was here that one of the first Malayalam dictionaries and the first Malayalam newspaper, Rajyasamacharam and Paschimodayam took shape. Kottiyoor Siva Temple: Situated on the banks of the Bavali River the temple is dedicated to Lord Siva. Thousands of devotees attend the annual 27 day festival during May-June. Trichambaram Temple: (21 km from Kannur) A Sacred Place of the Vaishnava cult, the deity of the temple is Sree Krishna. The sculptures on the walls of the sanctorum are in a class by themselves. Kunhimangalam: Kunhimangalam is famous for its unique bronze lamps and sculptures, near Payyannur. Thalasseri Fort: (22 km from Kannur) The fort constructed in 1708, was the military centre of the British. 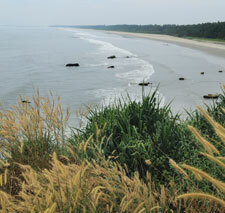 Meenkunnu Beach: Unexploited, the beach is a tourists’ paradise, with golden sand and surf. Ramaswami Temple, Thiruvangad: (25 km from Kannur) This temple, dedicated to Sree Rama is one of the most important temples in Malabar. The exquisite carvings in the temples are said to have been done nearly 400 years ago. Malayala Kalagramam: (29 km from Kannur) This renowned centre for art and culture at New Mahe, conducts courses in painting, sculpture, music, dance and pottery. Thodeekulam Shiva Temple: (34 km from Kannur) Located on the Thalasseri-Mananthavady road, this temple is famous for its mural paintings. It is believed to have been constructed 2,000 years ago and was closely connected with the Pazhassi Raja family of Kottayam. Pazhassi Dam:(37 km East of Kannur) An ideal retreat for tourists, the dam site is famous for its scenic beauty and the DTPC provides pleasure boating facilities at the reservoir. Ezhimala: (55 km from Kannur) The beautiful beach here has a hillock nearby (286 meters high). Carved stone pillars and an ancient burial chamber can be seen at the foot of the hills. Pythal Mala: (65 km from Kannur) This enchanting hill station, situated 4,500 feet above sea level near the Kerala-Karnataka border, is rich in flora and fauna. Aralam Wildlife Sanctuary: Elephants, sloth bears, sambars, deer etc. can be found in the 55 Sq km Sanctuary.